Felt Flap Wheel have been designed in such a way so that they will blow air while rotating, in this process the object which is being polished / buffed will get cooler faster. Secondly, they can be used as Abrasive Flap Wheels. 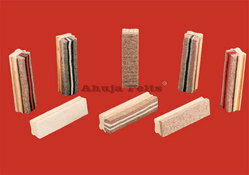 One can avail from us a quality approved assortment of Felt Duster. Owing to their top quality, our products are extremely praised amongst the patrons. Avaialable in various sizes. Light weight Dusters laminated with High density foam. Can be used for Black board and white board. Magnetic Dusters are also available. Felt Cords are used in Butter Press of Coco manufacturing. It is used as gasket / seal for butter press cover. 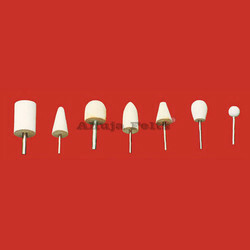 Mandrel Mounted Felt Bobs are available in various shapes & sizes. 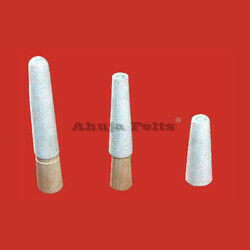 They are commonly known as polishing tools. Polishing of mould to mirror finish & scratch removing. Jeweller polishing, electro-plated products polishing, fountain pen nip and housing polishing. These shaped felt products are only tools available for micro-finishing, scratch removing, touchups. These products can be mounted on any high speed hand tool. 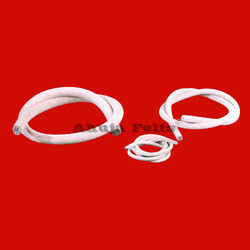 Felt Ring Buffers are also popularly known as Inside Ring Buffers. They are mounted on a wooden stalk. 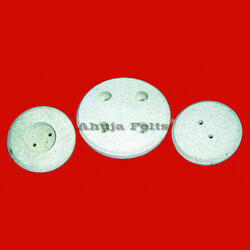 It is an important accessory of jewellery polishing kit. Felt is mounted on wood and available in various sizes. 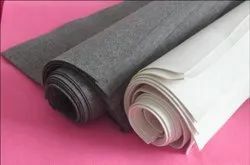 Pressed Wool Felt is available in Roll and Sheet form. Thickness from 2mm to 30mm. Higher thickness on request. Normally width of a Roll will be from 1.50 Meters to 2.00 Meters. Length will be from 5 Meters to 35 Meters depending upon thickness and Density. 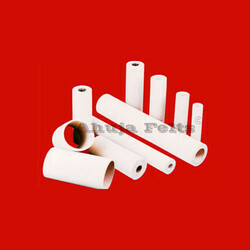 Felt Tubes are bio-degradable product. This is used for polishing and buffing, filteration and ink transfer in printing industry in coding machines. Pneumatic Heads are also called as Carrier heads or Felt Heads used in Air Tube systems. They have counter sink hole, edges bevelled and sometimes with cavity. 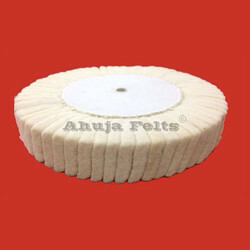 Ahuja Felts(Brand Of Ahuja Traders) is one of the leading Manufacturers and Exporter of Felt Bob, Felt Buffing Polishing Wheel, Felt Combination Buffs and Felt Cord. We offer these to our customers at market leading rates. We are well-supported by our team of highly skilled professionals who possess rich industry experience in their respective domains of business operations.